What if Multiples Hadn’t Expanded in 2013? Last year the S&P 500 rose by 30% while earnings grew by 5.5%. This year analysts expect earnings to grow by another 10%, meaning that they expect earnings to grow by 15.5% from 2012 through 2014. The red line below tracks the price of the S&P 500 if it grew at a constant rate equal to the earnings growth rate between the end of 2012 and 2014. 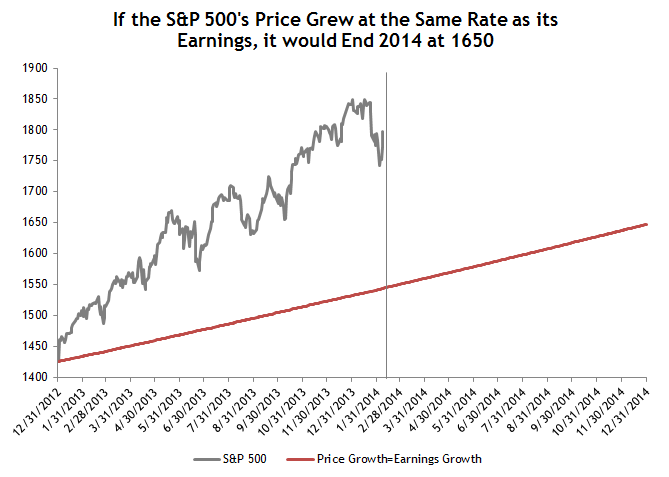 For the S&P to match the earnings growth path today, it would need to decline by about 14%, to 1544. By the end of the year, the index would finish at 1650, around 11% lower than it started the year. The line effectively represents the line at which the S&P 500 trades at the same earnings multiple as it did at the end of 2012. The multiple back then was 13.7x trailing earnings, which isn’t really that cheap or expensive.